Get the finest long-range scope. Developed for the military’s extreme long range shooting and hard target ever produced. Nightforce established new standards for performance when we debuted these scopes, and they remain the benchmark by which all other scopes are measured. The NP-R2 reticle is a versatile reticle for field tactical, varmint, long range and benchrest applications. Designed for shooters, NP-R2 provides exact hold points for windage and bullet drop as well as multiple zero points. The Nightforce NP-R2 is a performance-proven reticle designed specifically to enhance a shooter’s long range accuracy and ranging capabilities under a variety of field conditions. Each Nightforce NP-R2 reticle is calibrated at a specified magnification. This enables the shooter to accurately range a target, utilize multiple zero points and select from numerous hold points to compensate for both windage and bullet drop. In addition, the Nightforce NP-R2 reticle is etched on precision multi-coated compound glass. This ensures exact alignment and eliminates breakage. Due to Nightforce’s illumination technology, the glass etched reticle glows red and can be illuminated at different intensities. This technology ensures excellent reticle contrast in low light when illuminated or a well-defined black reticle when not illuminated. In addition, the fine line subtension (area of target covered) makes this reticle ideal for long range applications. Using the latest advancements in etching the shooter is guaranteed consistent spacings and therefore accurate range estimation. What makes the Nightforce NP-R2 reticle truly unique. 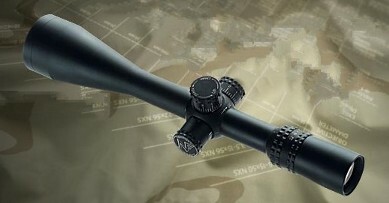 The vertical line of the NP-R2 reticle is divided into 2 M.O.A. increments (approx. 2 inches at 100 yards). These vertical increments are used for range estimation, multiple zero points and accurate bullet drop compensation. Any size target can be easily ranged using a simple formula: (target size in inches ÷ M.O.A. x 100 = range in yards). Once range is determined select an appropriate hold point based on the bullet drop of your cartridge. The vertical spacings can easily be split into 1 M.O.A. increments further enhancing long range accuracy. The horizontal line is divided into equal 5 M.O.A. increments for windage compensation. The NP-1RR reticle is a ranging reticle, best suited for varmint and long-range applications. This easy-to-use reticle will enhance a shooter’s ranging abilities and long range accuracy. • Easy ranging of the target in the field with no mathematical calculations. • Quick and accurate compensation for wind drift and bullet drop. The NP1-RR ranging scale works on the principle of known size of the target in inches. Targets are framed inside the circular elements of the reticle to quickly estimate the range of a target. • Deer average 18–20 inches from brisket to shoulder. • Coyotes average 18–20 inches in height. • Fox average 10–12 inches in height. • Prairie dogs average 9–10 inches standing. The ranging scale remains effective in the field even with small variances in target size. This MIL-DOT is designed for field tactical and long range field applications. Unlike many MIL-DOT reticles, this design features a hollow dot that will not obscure the target. This reticle is designed for fast range estimation and target acquisition in tactical situations. Developed by the military, the mil-dot reticle allows the sniper to estimate the range to his target. The mil-dot is now the standard reticle found in law enforcement rifle scopes. The term itself, mil-dot, refers to a trigonometric function called milliradian and a dot, which appears as a series of round shaped reference points located on the reticle. Advanced developments at Nightforce have resulted in the creation of a new style of mil-dot reticle. Rather than the solid dots that obscure most of the target, the Nightforce mil-dot reticle consists of see-through round dots which are placed on the vertical and horizontal cross lines that serve as reference points. In addition, all four posts are also see-through. Because both the dots and posts are clear, the target is no longer obscured. As a result, these features enable the sniper to more accurately estimate the range to his target. The dots are spaced precisely 1 mil apart which represents 3.6 inches at 100 yards at specified power. The mil-dot design is etched on precision multi-coated compound glass. This eliminates breakage and misalignment of the reticle. Because of Nightforce’s illumination technology, the glass etched reticle glows red and can be illuminated at different intensities. This flexibility ensures excellent reticle contrast in low light when illuminated or a well-defined black reticle when not illuminated. This close range MIL-DOT reticle design enables shooters to use a MIL-DOT reticle at close range. This close range tactical reticle was designed for the 1-4x24 and 2.5-10x24 NXS compact scopes. A versatile reticle, the NP-R2 is well suited for a variety of applications which includes field tactical, varmint, long range and benchrest. Available for all Nightforce riflescopes, the NP-1 is designed for tactical, varmint and big game use. Field tactical, varmint, big game, light hunting, benchrest and 1,000-yard shooters can benefit from the design of this double-dot reticle. Favored by two classes of shooter, the NP-2DD is the reticle most preferred for predator hunting in low light conditions. When measured at 22x, tapered horizontal bars reaching 4 M.O.A. from the center and a floating .1875 M.O.A. center dot draw the hunter’s eye to center for quick target acquisition with minimal illumination flare around the center aimpoint. This reticle is also highly functional for benchrest shooters when combined with Nightforce Precision Benchrest models. A secondary .125 M.O.A. diameter dot is located 4 M.O.A. below center at 22x. This dot is a 500-600 yard holdover point for most flat shooting cartridges. This simple and effective reticle performs in long range situations while maintaining quick target acquisition capability for short distances. The CH-1 reticle is a simple design for varmint and benchrest competition. The CH-2 reticle is an efficient reticle, designed for high power competition. Designed for long range, high power competition, the CH-2 features a .200 M.O.A. dot on a .030 M.O.A. crosshair when measured at 22x. This .200 M.O.A. dot is calibrated for scored shooting on standard NRA high power competition targets. This reticle was designed in response to extensive research conducted by Nightforce with the cooperation of the world’s foremost high power competitors. Nightforce is proud the United States Army Marksmanship Unit has chosen the CH-2 over all reticles for high power competition. The CH-3 is a unique reticle, designed for benchrest competition. Only the center dot of the reticle is illuminated. Designed for benchrest shooting, the CH-3 reticle features an extremely fine crosshair and dot. This fine crosshair and floating dot creates the perfect long range benchrest reticle to compensate for mirage and wind conditions in 1 M.O.A. increments. Combined with a high magnification and variable power, the CH-3 allows the competition shooter to bracket the bullseye while maintaining a center aim point. Unlike Nightforce’s other illuminated reticles, only the dot is illuminated on the CH-2 reticle. This reticle is available in the following NXS models: 5.5-22x56, 8-32x56 and 12-42x56.